Has anyone been able to fend off PSG? I have for the exact same player but it doesn't stop them trying in other windows. I'ts when you you have the chat with him to see if you can resolve his issue. I picked the option where (cant fully remember what it said but i can give you what is sounded like or familiar to) it stated something along the lines of "I dont want to lose you, you're an important member of this team and are you willing to leave with these bunch of teammates" and then his reply was like " You're right, these are a great bunch of lads, thanks boss". He's a team leader in dynamics and vice captain. The fact you have won something with them means you've done well enough for him to want to drop his statement given playing time and praise. I have manolas in situation and where barca came in for him and i just told him to drop it as we just won the league and ucl and he was an integral part of the backline and he went full ****** on me and said he wanted to leave and publicly and with team mates stating his leave. some players were like let him leave and i said to them that he's an important member and will do well to keep us challenging. Everyone took it well and dropped all concerns except manolas. I'm just gonna keep him and play him in until he drops it and has faith back with me. His relationship with me is he holds my standards high but his agent is a douche so i have a feeling it's him pushing him out all be it not part of the game lol. Also what are you camera angles for the 3 vids given, it shows a lot more content and structure to the one's ive tampered with/tested to show the best form of showing highlights. yeah I was always using CF-Su and DLF-Su, even F9 until my United save last year where Lukaku was immense as TM-At. AF-At with DLF-Su is still a wicked combo, although I don't like that they stuck Move Into Channels onto DLF. I'm very stubborn in changing formation and tactics so i wont try it but theoretically it's what a 442 would hope for or at least back in the day when 442 was viable. Reminds me a bit of leicesters freaky season with okasaki and vardy or that sulimani guy or whatever his name was. Never quite understood the move into the channels as the intrepretation has more than 1 way, such as going wide like lukaku does in reality playing from RW and moving in or move into the half spaces between defenders to either run beyond or pick up the ball and shoot or to create gap space for another to move in etc. @Rasmus Have you tried the standard "you're too influential to leave" convo with them? De Gea's a Model Citizen so should be easy to work around, and that worked on both of them for me. 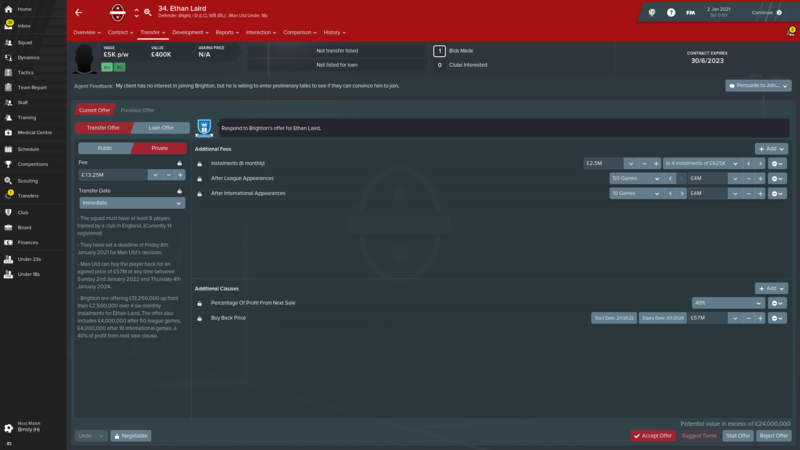 Although I did win the League-CL double first season which probably helped. Ugh, not exactly. I think I went a long the lines of "You are staying here and there's nothing you can do about it" with both of them. Not sure I will ever be able to have that conversation again. If I ever get the chance to have a conversation with them again, I will take that advice. I was way to aggressive with them. The camera angles for the vids are standard TV. The one against Man City is standard Sideline though. So I pretty much have to wait it out and keep playing and praising them? @Rasmus currently in the off season between 1st and 2nd season and PSG have also been unsettling Pogba and De Gea. So far, I've rejected bids by asking for more money, which PSG declined. With De Gea a small conversation helped ("why would you want to leave"). 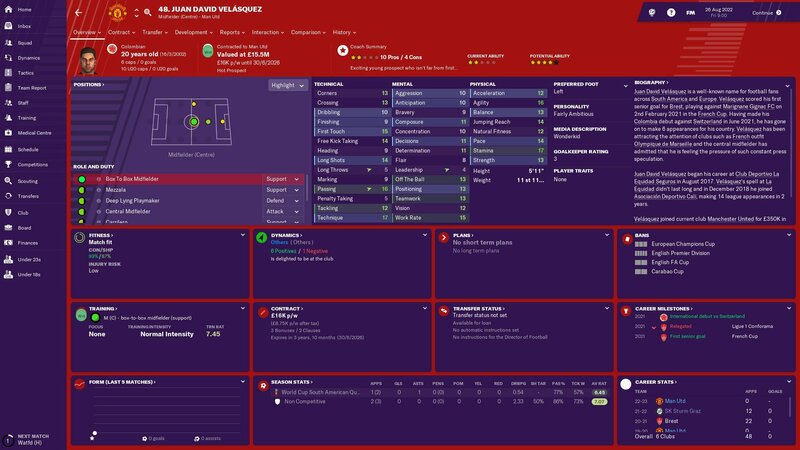 Pogba however, is still unhappy and I did have to do a squad meeting because a lot of his colleagues were angry that I didn't give him a dream move. Telling them that this would weaken our squad got them around very quickly (players are apparently very very dumb according to SI). 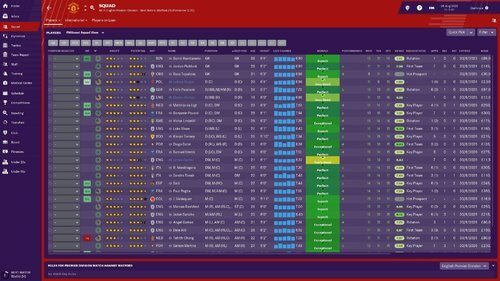 So far I've seen PSG buying a lot of other players, so I hope their money will run out and they won't come back in for mine. 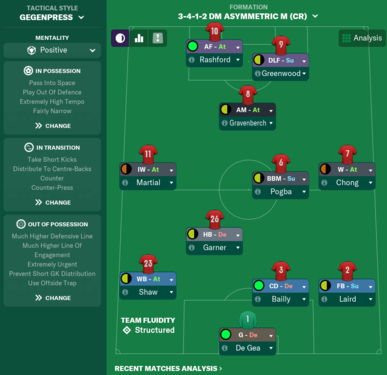 Can you also tell a bit more about your 4-4-1-1 setup? 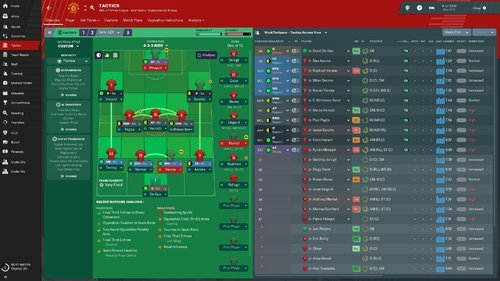 I'm looking at this as an alternative for the 4-3-3 I've been playing first season but haven't been very succesfull in pre season yet. Pretty much what I did lol, Also is your 4-3-3 the 4-1-4-1 or 3 strikers up top? could help with that considering I had my first season unbeaten but quite useful with the average united side. Similar to mine then, what do you need help with and whats your style? @blue heron PSG seem to have cooled their interest in De Gea for now, as he is no longer wanted by them. No bids for Pogba either, but still wanted by them. No bids in a while though. I've also rejected a number of transfer list request now and his training performance is becoming abysmal now. I'll keep fighting for him though. AMC: Attacking Midfielder - Attack, PI: Take more risks......I might try out "hold op ball" for him, cuz I want him to be more patient with the ball at times. Right now he's more of a scoring AMC than an assisting. Positive mentality - Sometimes I change to balanced if it's against a great opponent. 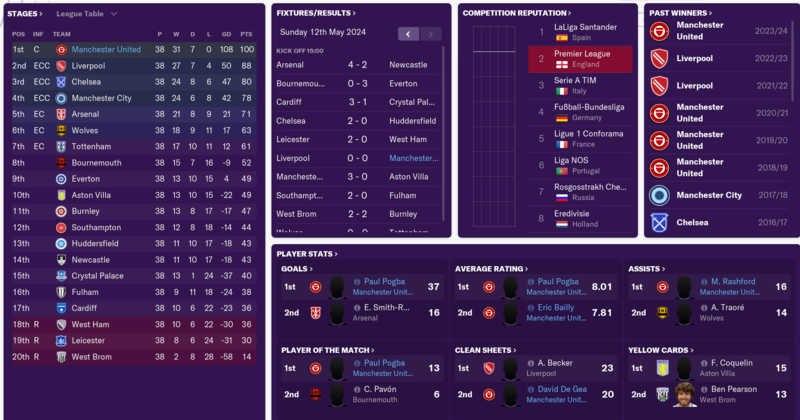 Learned the hard way against Liverpool in the FA Cup final, and trailed 3-0 at half time. 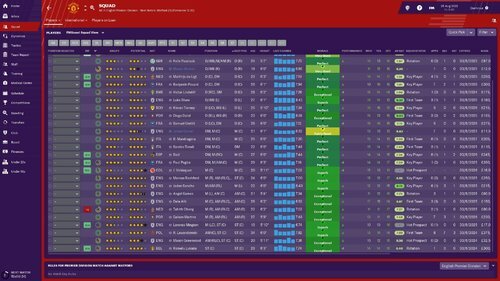 Played the CL final against Barcelona on balanced and it worked great. Mixed passing and Low crosses (just a preference). Counter Press, Counter Attacking, distribute to central defenders and full backs, short kicks from the GK, and play out of defense. If I'm defending the lead I sometimes change from counter press to regroup. Especially against top teams. High LOE, High def. line. Tighter marking. More urgent pressing. I think that's it. I'm on my laptop at the moment. The Wide Playmaker role needs a type like Pereira, who' probablt more experienced in an AMC role. Had to retrain him as an MR. Lingard hasn't done quite as well as a wide playmaker yet. I'm struggling to find a suitable role for him now. I'm not particularly happy with the winger role for him. He's not that fast and his dribbling isn't top standard as well. Maybe Wide Midfielder support/attack would be better for him. I see him more as a pass and move type. Applause for total honesty (which is extremely rare in these team threads). Ngl if this was me i'd quit and restart the save so fair play to you on that note. Check your satisfaction thing with the board and see how much it effects you, if you're below that 50/60% mark or close to it then i'd be quite worried. Try boosting morale and give some criticism, may work to their ends to perform back the way they should. To me the away strength is too much, even against poorer sides it's hard to get results or even big results on some basis. Then again it could be freak shocks like yours. Couldn't believe they let me have Hazard for that price. Wanted rid of Sanchez at any cost just to get his wages off the bill, was willing to let him go for £0. 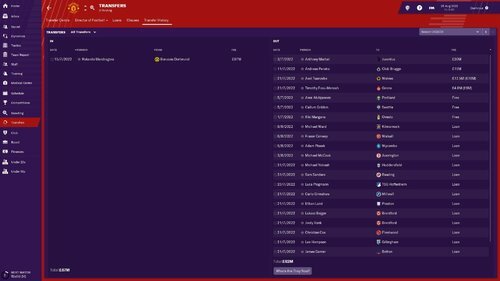 Neves was pretty easy to sign, only on £88k a week. 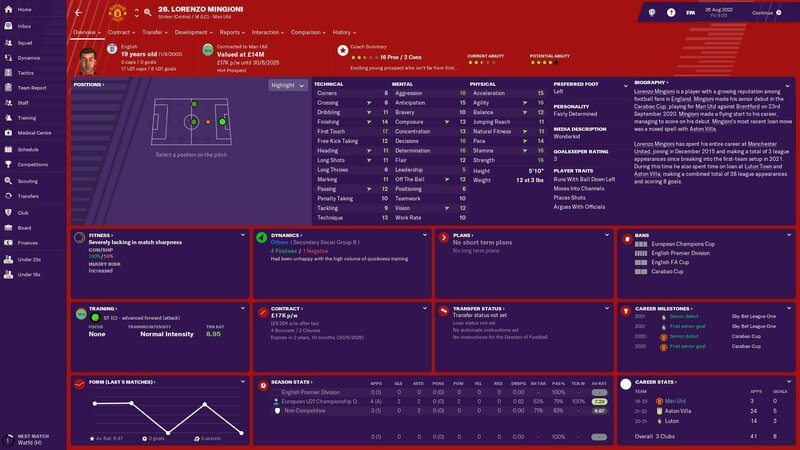 First season signing are always freaky, I remember in the beta I bought bentacur for 30m and he played like a 140m signing. Tried doing the same thing in the 19.1/2 and they wanted 85 lol. Guess it's pretty much a straight swap for sanchez positioning then? Yeah i tried getting rid of him at the start of 2nd transfer window and had to deal with a loan move paying only 30% of his wage while Chelsea payed the other 70%, worst signing on my game with 35 games 5 goals and 6 assists that had no impact at all... Pretty good on that, tried bidding 50 too but they wanted 80 and so I focused on getting cook (instead of milikenkovic savic cause i'm a douche- liverpool bought him in jan ) and a few others like sidibe to cover that RB spot and manolas whom I always buy as a solid CB and telles whom i've realised is the brazillian tiereny or the next marcelo. 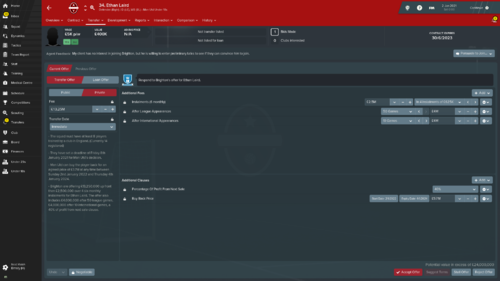 Time to show some bits from my save with United after six seasons. 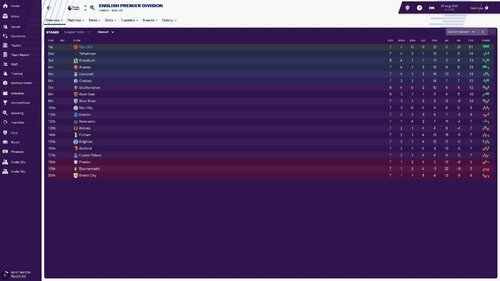 I have just won my fourth Premier League (2019, 2020, 2021, 2024) - Liverpool were outstanding in the last two seasons with 101 points in each. So it was nice to win back the championship unbeaten and with 128 goals for and only 20 against. Look at Pogba. 37 goals, new record! 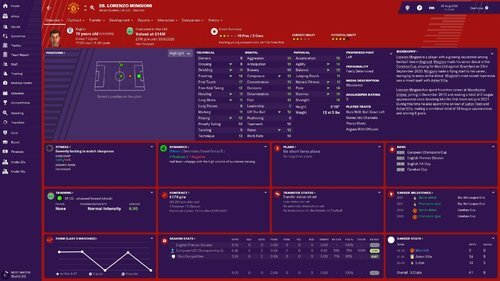 He scored 43 goals in all competitions and was by far my top scorer. Rashford (22), Chong (21), Greenwood (21) were next on the list. 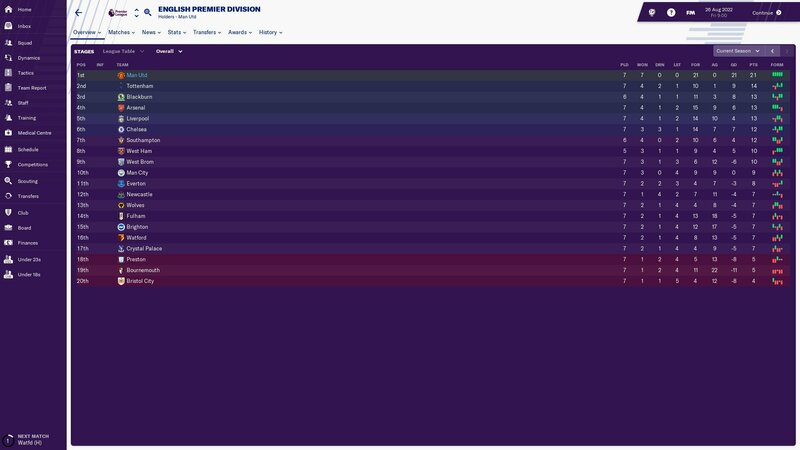 I have won the Champions League four times (2020, 2021, 2023, 2024) but I am not much worth in the domestic cups with only one FA Cup and two League Cups. For me playing with United is about making most of the young talents. This year it is Angel Gomes, Tahith Chong, James Garner, Mason Greenwood and Ethan Laird. 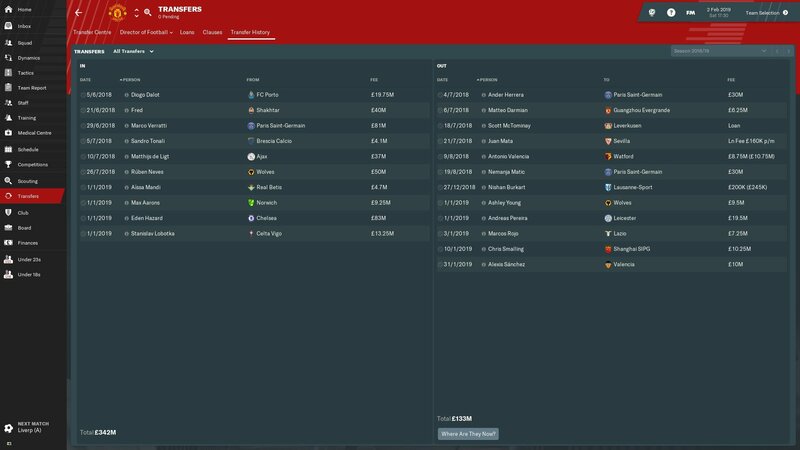 Anyway, that is the five players who has became first team players for me. Some of them are key players now. Gomes is fantastic with his versatility in the attacking positions. Excellent player for me. Laird is a great backup on the full back positions but not more than that. Had hoped for better development in the mental attributes. I am loving Garner as a new Carrick. 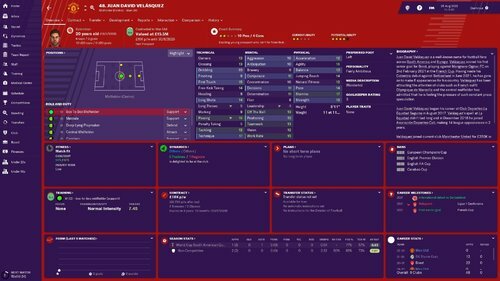 Using him a lot as half-back. First team player. The best of them all. Fantastisk development. One of the best players in the world right now. "Elite winger". 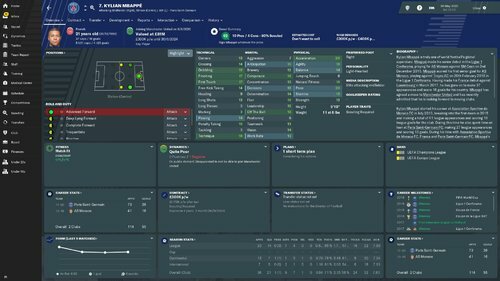 Had hoped for a bit better development but with 91 goals the last four season I am satisfied! What are your tactics like? also do you play angel as a AP or treq? It varies a lot. Also for Gomes. He has played as an IF, AM and CM. 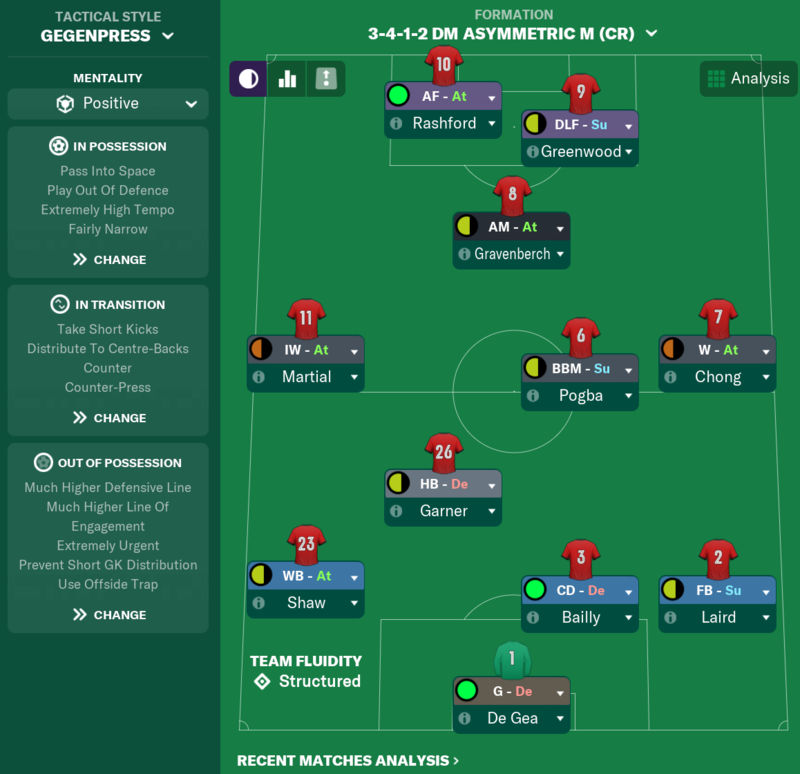 I have mostly played a 4-4-1-1 or 4-3-3 with high pressure. 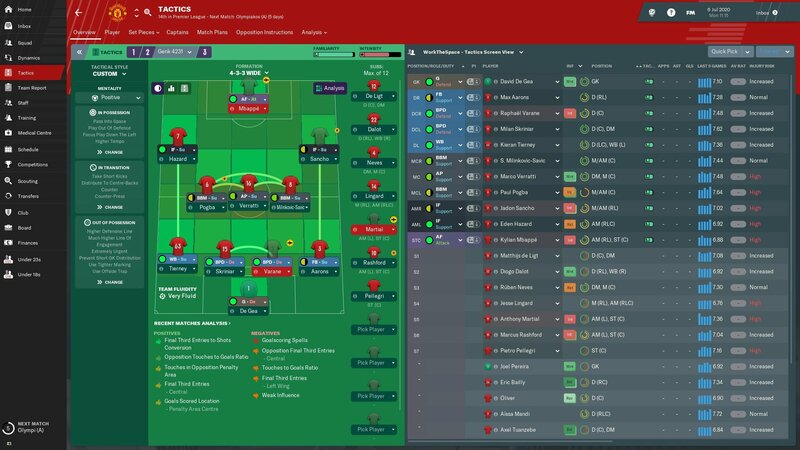 Wasn't dissimilar to the Big Sam 5-4-1 of FM17/18 - Ole's 1-2 front line was always going to struggle against that, but no movement or urgency! So poor! Depends on the players/roles around him tbh. He's getting 20+ goals a season for me in a 4-2-3-1. 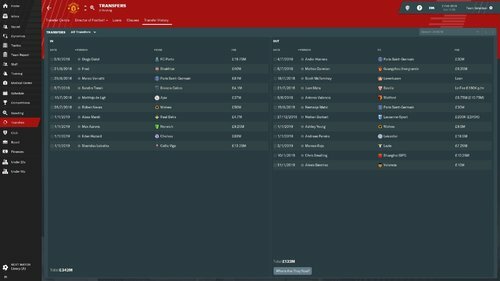 So the transfer window for Season 21/22 has just about ended, so I thought I'd post a quick update. As above, we lifted the FA Cup following a 6-3 win against Liverpool after initially going down 2-0! 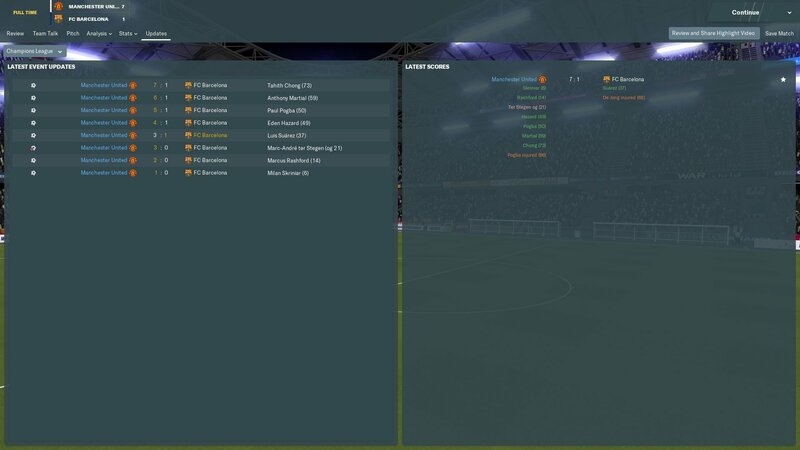 We also retained the Champions League, defeating Valencia in a fairly straightforward 3-0 affair. Just the one signing this summer, young winger Dan Myers-Perry joins from Bristol City for 2mill. Has great attributes in all the key areas, and is definitely one for the future! Also joining the squad are James Garner, Mason Greenwood and Ethan Laird, all returning from their loan spells in the Championship. I'm particularly excited about Greenwood, who has been in electric form over pre-season. Main outgoings are Fosu-Mensah and Sanchez. Sanchez has deteriorated beyond recognition, so will see out his career in the MLS. TFM was nothing more than backup last year. 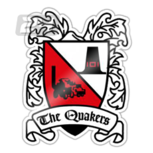 Mengi, Ross, Jackson and Geddes are prospects chosen to spend time in the Championship this season. The other major news is we have a new No.7. After forcing his way into my starting XI, and running riot in the Champions League final. Angel Gomes takes the shirt for the foreseeable. just start a save with MU. 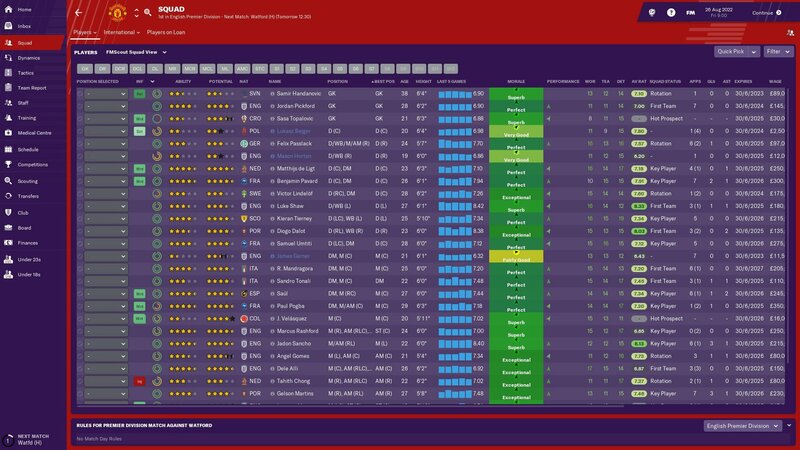 For young potential player (Chong, Gomez, Greenwood) it is better if I loan them out or keep them in u23/u18 team with a rare playing chances (around 10-15 chances but not full time) in senior team? I can only speak for myself but I tend to leave them in u23 for the first season with a few appearances in cup games against smaller opposition or give them time when injuries dampen the squad. I kept greenwood in u18 in first season cause of his input and confidence and training that is quite high but very impressive for his age so he bolds well and gave burkart room to play his own game so up his value to be sold later on. Greenwood got chances in u23 games and cup games I believe when burkart was injured and rotated well with chong upfront at times so it was useful experience. 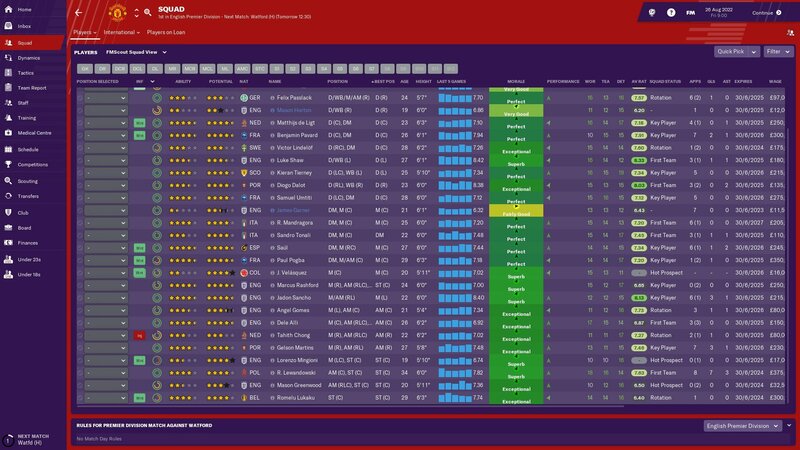 I'm onto my 2nd season now and greenwood is improving still having just been put into u23's and i've kept angel and chong and their training attributes are always improving. Chong has been slow but angel and greenwood seem to be the best of the bunch. Also i've promoted garner to u23 who seems to be brilliant in both DM and CM roles. Personally I think you should always give chong starts in weaker games either in cup or even league games as he can do quite well and would boost his stats. I tend to hate loaning players out simply because of playing time, they get played out of position or their training improvement is worse off 80% of the time than what they'd get in u23. I always keep training facilities at the highest. However if a prem team or championship top team come looking for a loan under first team agreement then i'm happy to oblige but I ALWAYS "can be recalled" clause in just incase they are terrible and don't fit in. 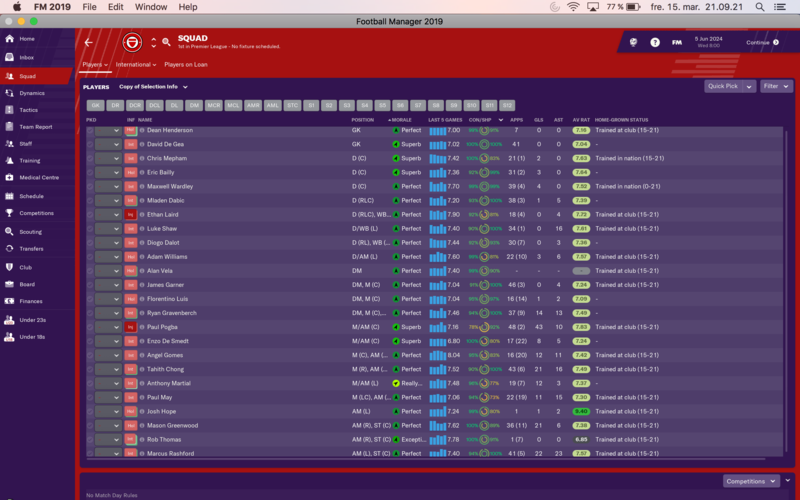 First season, I had Chong, Gomes, Garner and Laird playing 5-10 first team games each. Chong & Gomes played U23 football, while Laird and Greenwood played both U18 and U23 football. Second season, Chong and Gomes became first team players (20+ games each), then were part of my starting XI in my third season. 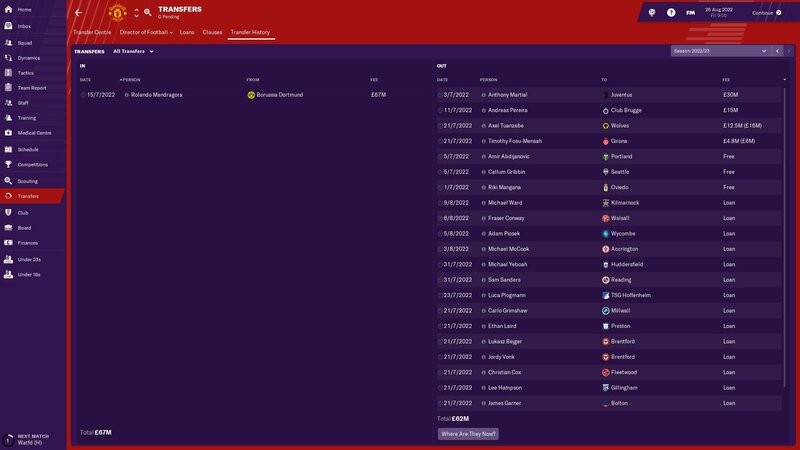 Laird, Garner and Greenwood all went on loan to Championships for both seasons and will likely be squad players in my fourth. Mengi is also extremely promising and has followed roughly the same path as Laird only a season behind. 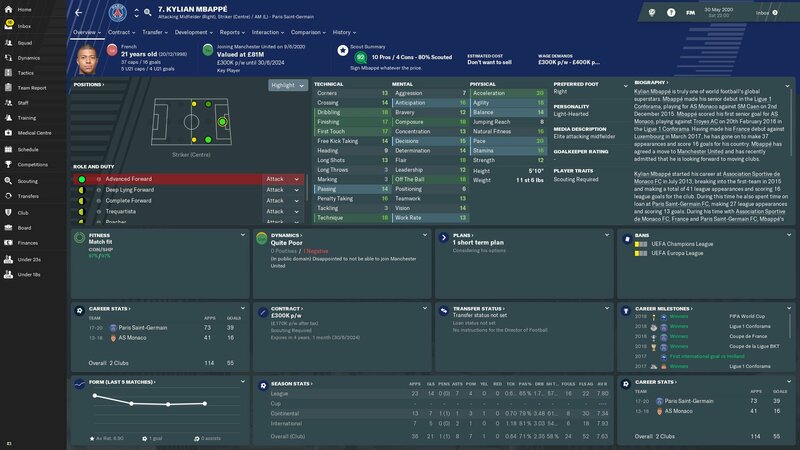 I try to keep them at the club until they turn 18 as that's when I can mould them the most, then make a decision on whether to move them up or loan them at that point. 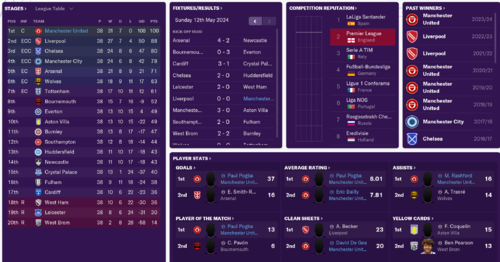 Good end to the season, to complete the treble. impressive what is your tactic ??? So, err, how does one sell Sanchez? I had it out with him and now we can't stand each other and I need to rid myself of him. I've offered him out to clubs, while offering to pay a massive majority of his wages. Nobody wants him. He's the "virus" in my team right now. This worked. Had 5 offers for him. Hoped he'd take the Milan offer, but he only wanted Spurs. 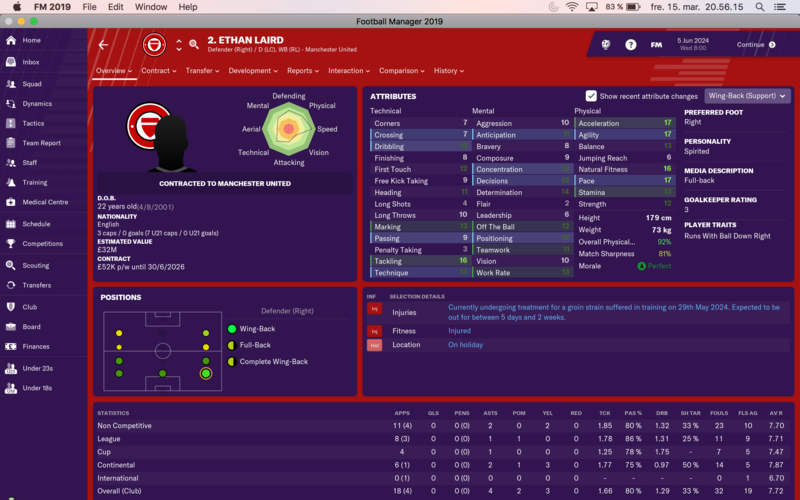 So have shipped him off on loan. Future fee 55m. Decent. Especially if you're on the update where he's not as good. He'll definitely score against you though, it always happens. That they acknowledge it in the commentary is cool...unless you play in Italy, or manage Chelsea, as there's been so many loans and guys only staying at a club 6 months that it feels like half the league is scoring against their former club on a daily basis. Think this would happen every time they sell up. United as a football is worth an absolute fortune. You'd need to leverage something to purchase the club, same way the Glazers did.